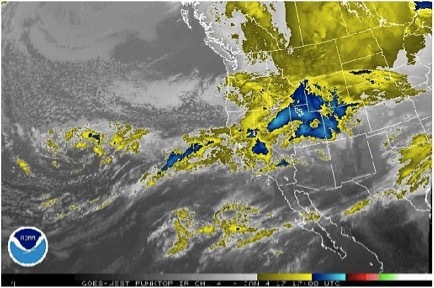 The New Year began with two low-pressure systems, one in the northwest, and another off the California/Baja coast creating a stream of moisture from the Pacific into Colorado. This produced 12-18” of low density snow across the area. CBMR reported 14” of snow and .3” SWE over the two days. Winds out of the southwest averaged 10-25 mph above tree line with gusts in the 50’s. 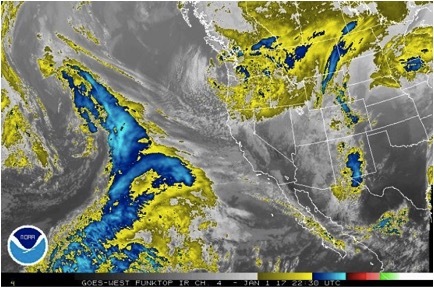 1/1/17 – Satellite image from the National Weather Service showing the two low-pressure systems, one in the northwest and another off the California/Baja coast. Clouds can also be seen beginning to form over Colorado. The storm picked up in intensity from the night of January 3rd through the 5th. 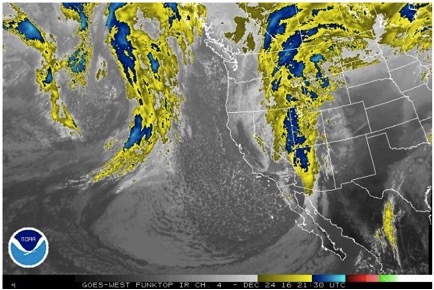 The jet stream lined up overhead producing a west-southwest flow and providing abundant moisture from the Pacific. By the morning of January 5th, Schofield had received 3.7” of SWE and 30” of snow since January 1st. 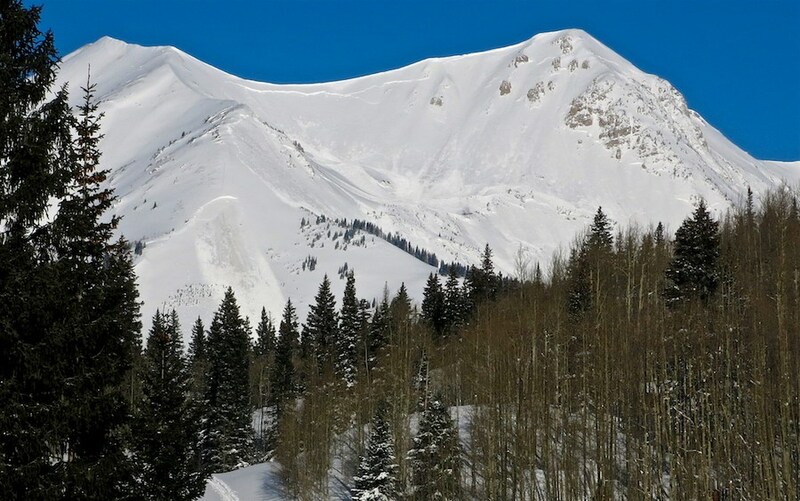 On the 5th, a powerful cold front slowly sagged south over Colorado and the Crested Butte area got pummeled with snow falling at 2-3” per hour rates throughout the day. After the cold front passed, measured storm totals since New Year’s Day were 5.56” of SWE and 57” of snow at Irwin, 5” of SWE and 41” of settled snow at Schofield, and 47” of snow at CBMR. Behind the front, colder, drier air moved in, leaving clearing skies and frigid temperatures in its wake for January 6th. 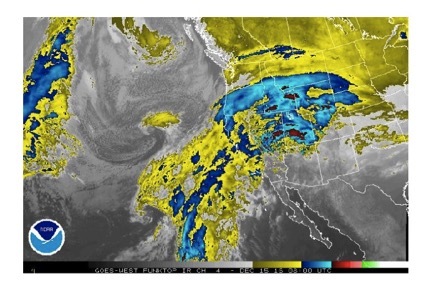 1/4/17 – Satellite image from the National Weather Service showing the abundant moisture flowing into Colorado from the Pacific. There were a number of problematic surfaces at the storm interface that had formed over the previous dry week, including near surface facets, surface hoar, melt-freeze crusts, and slick wind crusts. The storm created a sizeable slab that was sitting on those interfaces and persistent weak layers. The observed human triggered and natural avalanches grew larger in size as the storm progressed. Initially, there were touchy, relatively shallow storm slab instabilities, even with surprisingly low density and incohesive slabs. 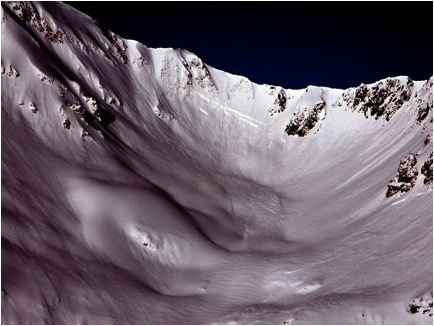 By the later parts of the storm, larger avalanches were failing naturally on these interfaces. 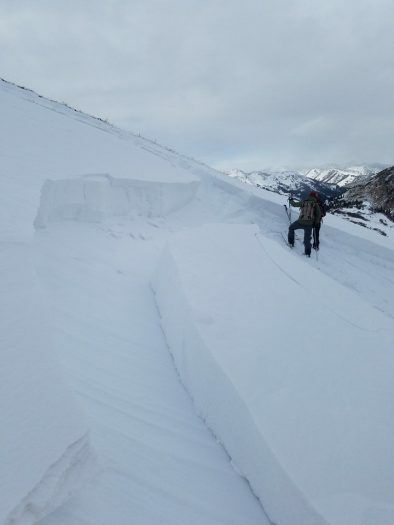 The avalanche danger was rated as HIGH on both January 4th and 5th and a major natural avalanche cycle occurred with reports of many D2 to D3 avalanches around the zone. There was even some avalanche activity that 45-year locals had rarely seen. 1/3/17 – Skier triggered D2 storm slab on Schuylkill Ridge that failed on a surface hoar layer buried at the beginning of the storm. 1/6/17 – Natural D2.5 Persistent Slab avalanche on a southeast aspect of Purple Peak. 1/6/17 – Natural D2.5 persistent slab avalanche on an east aspect of Mt. Owen. 1/6/17 – CBAC Snodgrass Snow Study Plot profile showing the snowpack after this week’s major storm. From December 20th to 22nd, the snowpack continued to stabilize after the major December 16/17th storm. Valley inversions dipped to -15 in town. 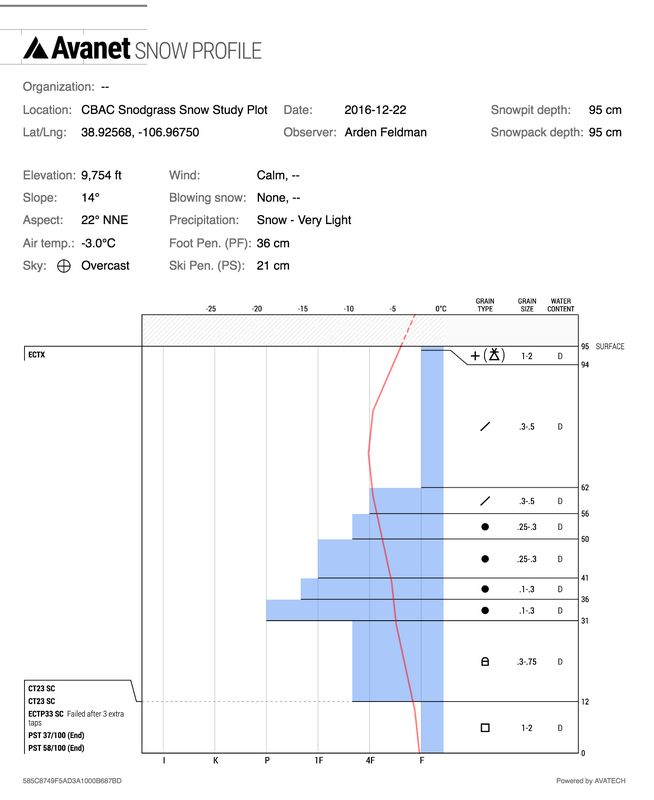 12/22/16 – CBAC Snodgrass Snow Study Plot profile showing the stabilizing snowpack after the December 16/17th storm. A warm southwestern system impacted the Elks on 22nd. The storm brought with it snowfall rates up to 2” per hour and 20-30 mph west winds above tree line. Schofield received 14” of snow and 1.3” of SWE and CBMR received 8” of snow and .8” of SWE. The avalanche danger rose to considerable at all elevations on the 23rd and observers reported natural and skier triggered storm slabs. On the 23rd and 24th, winds out of the south averaged 15 mph with gusts up to 64 mph at the Elkton weather station. These strong southerly winds created unusual loading patterns on north faces. For example, the north face of Ruby Peak had been wind scoured near to the ground during the 12/16 storm, but was reloaded by southerly winds, and produced two natural slabs, breaking 2-3 feet deep. A large slide also ran to the valley floor off of Gothic. 12/24/16 – Pair of 2-3 foot soft slabs that ran naturally on the north face of Ruby Peak, failing on old snow at the ground. 12/24/16 – Natural avalanche on northeastern aspect of Gothic Mountain. A cold front brought snow and strong winds from the west on the 25th. 7-14” of snow fell across the zone with Schofield picking up 8” and .8” of SWE. 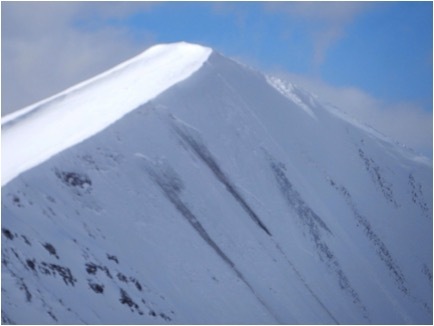 The strong winds formed sensitive wind slabs on leeward slopes. 12/24/16 – Satellite image from the National Weather Service showing the Christmas storm on its way to Colorado. 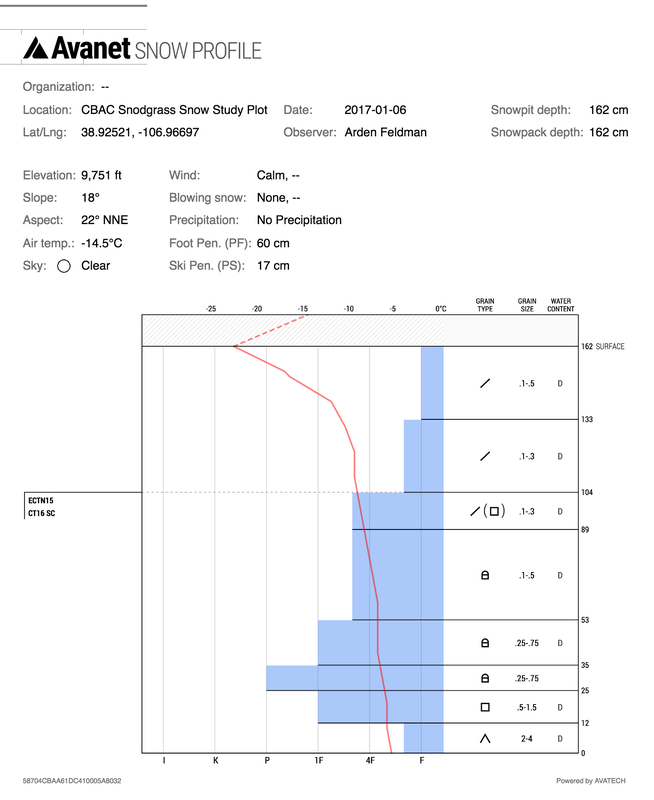 12/25/16 – Small skier triggered wind slab near tree line on an easterly aspect. The 26th of December through the end of the year was characterized by dry conditions, with powerful southwesterly winds, cold temperatures, and strong solar radiation. 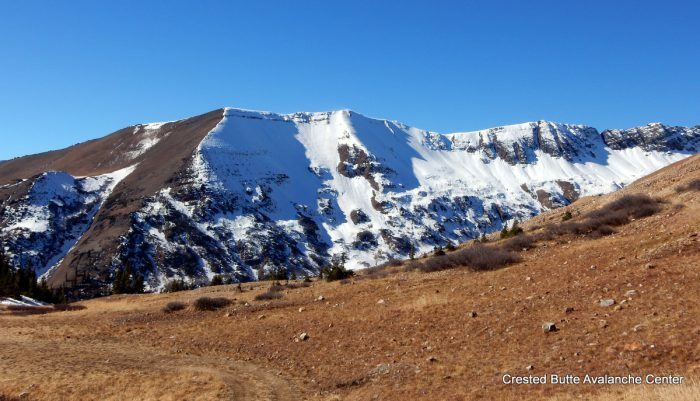 Over this time period, the avalanche danger slowly fell. 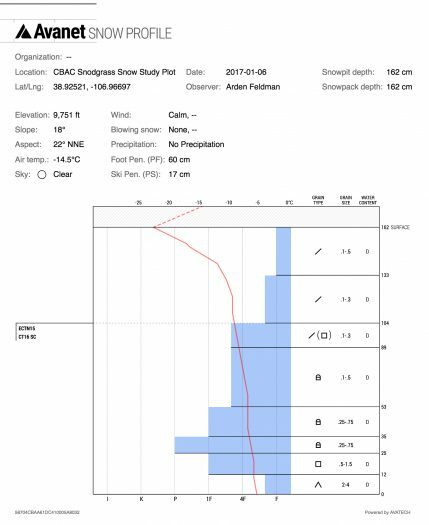 Wind slabs were a significant issue during the first part of this timeframe due to the strong winds and ample snow available for transport. The wind slabs did eventually heal and persistent slabs became the main avalanche concern. Although slowly healing there were still instabilities in the middle of the snowpack in the form of near surface facets and surface hoar buried during the Christmas storm. And of course the snowpack’s basal weak layers still provided cause for concern of deeper instabilities especially near and above tree line on steep, rocky faces and bowls. Several large avalanches ran naturally on basal weak layers over this time. 12/27/16 – Slab avalanche on Schuylkill Ridge that failed on a mid pack instability. 12/26/16 – Natural, 3-5 foot deep, D2.5 persistent slab avalanche in the Anthracites that ran on or near the ground. With clear skies, cold temperatures and strong solar radiation, future persistent weak layers formed at the snow surface during the dry spell at the end of the year. On southerly aspects, stout melt freeze crusts formed, while northerly aspects experienced near surface faceting. Our winter had a slow start this year, with mild temperatures and little snow through mid November. Any snow left on the ground from October’s light snowfall events was confined to northerly aspects at high elevations. This snow formed a pronounced layer of facets, coupled with crusts in some cases, creating a future persistent weak layer. 11/14/16 – Shady northeasterly aspects of Purple ridge snow covered with sunny aspects bare. From mid to late November, we saw a few small storms. This new snow began to facet on various aspects. The storms were often windy with lots of snow transport forming stout, reactive, slabs on top of the October facets. 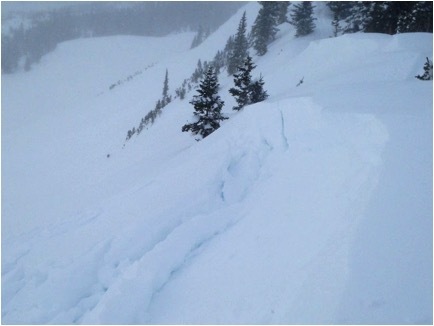 Natural and skier triggered avalanches were observed during this time, mostly D1 to D2 in size. 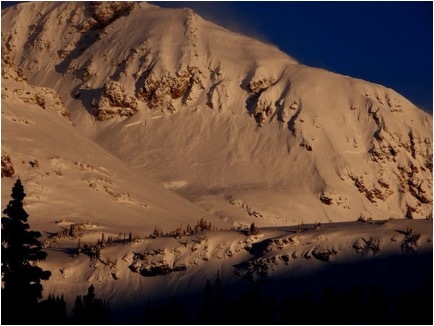 11/20/16 – Skier triggered avalanche near Yule Pass. Hard slab that slid on October facets on north/northeast aspect. The first major storm of the season occurred on November 28th, with accumulations near 2 feet in the western parts of the forecast area and less in the east. The Schofield Pass snotel site received 2.2” of SWE. 11/27/16 – Satellite image showing the major late November storm impacting Colorado. 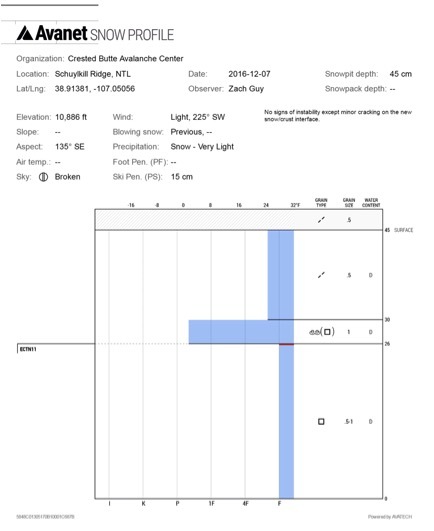 This snow, combined with some existing slabs from the previous 10 days fell on sensitive weak layers near the ground on high elevation, northerly aspects. 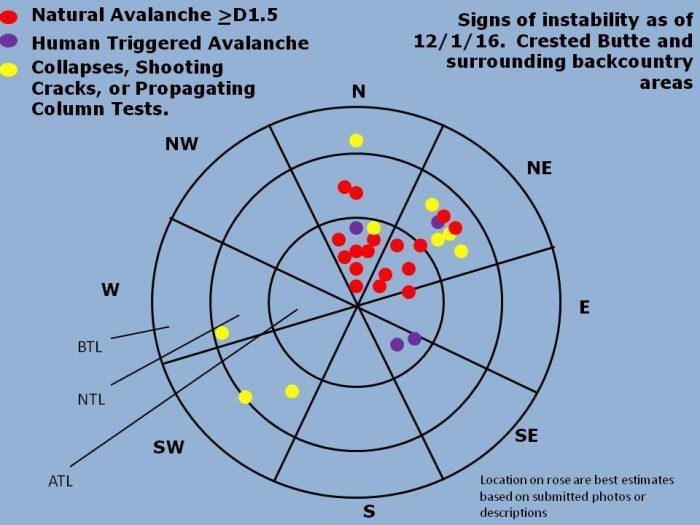 This caused the first avalanche cycle of the season, with HIGH avalanche danger above treeline on November 28th. 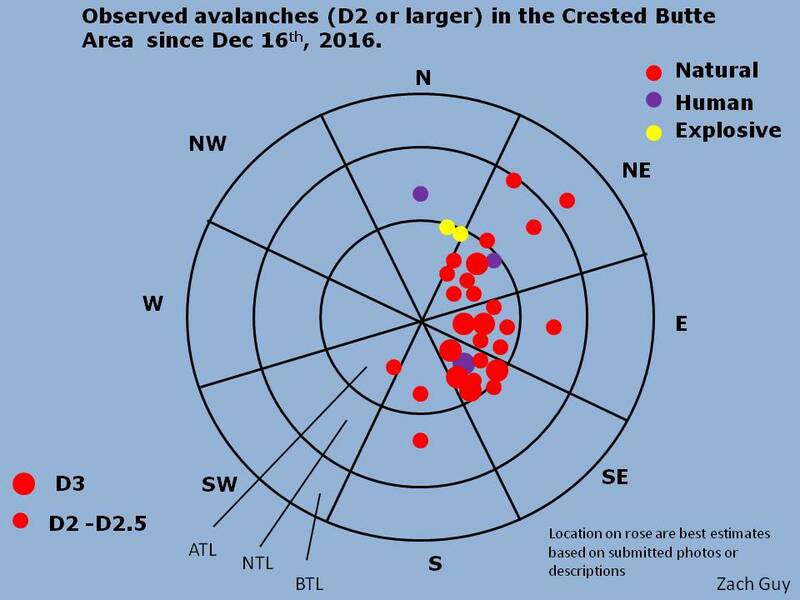 High elevation northerly aspects were the most suspect slopes, with numerous natural slab avalanches up to size D2. 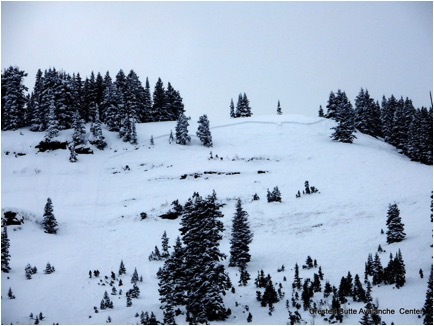 At least a few avalanches also occurred on southerly aspects, including a close call in Red Lady Bowl on November 29. 11/29/16 – Skier triggered avalanche in southeast facing Red Lady Bowl after the November 28th storm. 12/1/16 – Instability Rose showing suspect northerly aspects. Starting on the December 6th, the forecast area got back in the storm track, with zonal flow delivering storms every couple of days. This new snow piled up and added a load to the weak layers still present near the ground and also created slabs on the recently formed weak layers. The following two snowpack profiles exemplify the weak structures on both north and south aspects going into an active weather pattern in early December. 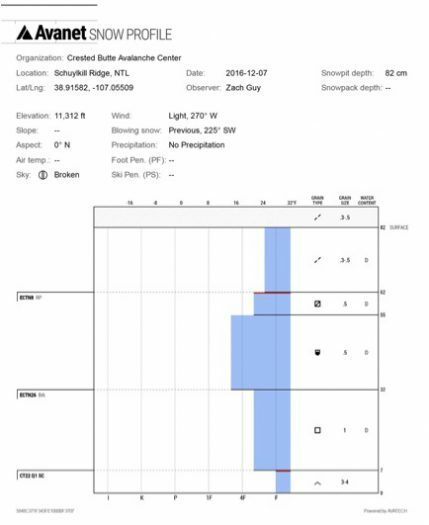 12/7/16 – Snowpack profile of north aspect on Schuylkill Ridge showing the December 6th interface on near surface facets at 62 cm and the weak depth hoar near the ground. 12/7/16 – Snowpack profile of southeast aspect on Schuylkill Ridge showing the December 6th interface with a crust sitting on weak facets. 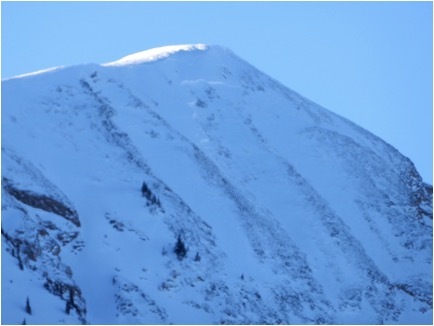 Numerous small avalanches were observed failing on the December 6th weak layers, like this small soft slab on December 9th. 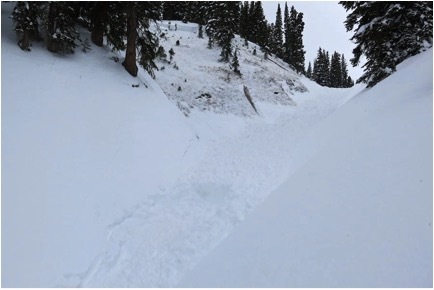 On December 12th, a snowmobiler near Washington Gulch was caught and fully buried in a gulley, after triggering a 3.5’ persistent slab that failed on the ground. 12/12/16 – Snowmobile triggered, caught, and fully buried in persistent slab avalanche that failed on facets near the ground. The consistent storm pattern ended with a bang on the 15th through 17th of December when a very powerful trough hit the region. 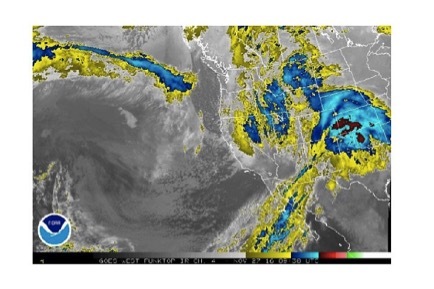 Fueled by Pacific deep moisture, the storm was generally very warm and wet with low snow-liquid ratios. Near the end of the storm, late on the 16th, a powerful cold front passed over dropping temperatures up to 30 degrees. The cold front brought with it wind gusts up to 100 mph and snowfall rates up to 4” per hour. 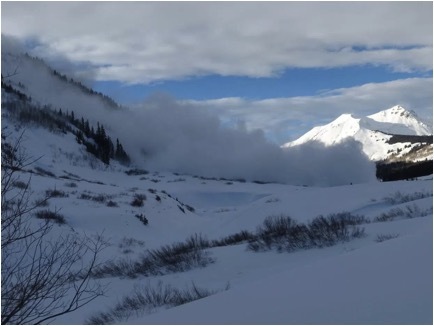 The Schofield Pass Snotel site recorded a massive 4.8” of SWE during the mere 36-hour extent of the storm. The 4.8” of SWE only amounted to 31” of snow due to the storm’s warm temperatures. Closer to town the Butte Snotel recorded 2” of SWE and 15“ of snow. 12/15/16 – Satellite image showing the plume of pacific moisture being directed at Colorado. The December 16th-17th storm added a huge load to our relatively weak snowpack, causing a widespread avalanche cycle. An Avalanche Warning was in effect on both the 16th and 17th, and the avalanche danger was rated as HIGH at all elevations for both days. 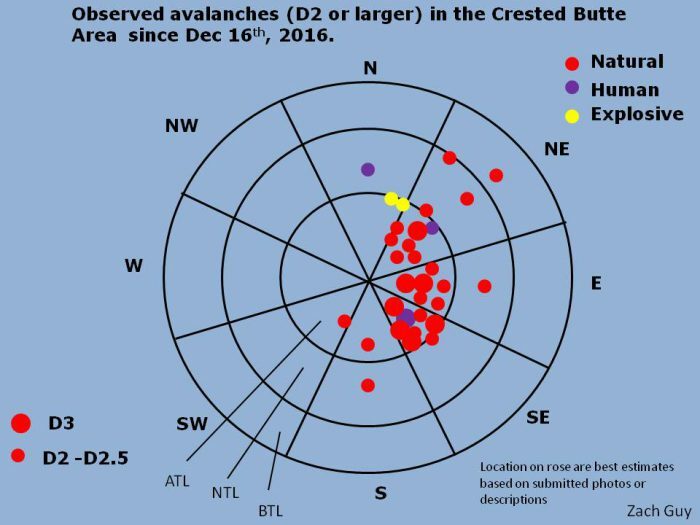 Numerous D2 to D3 avalanches, both natural and skier triggered, were observed at various elevations and aspects in the forecast area. These avalanches generally failed on weak layers near the ground, but there was also a widespread mid storm instability caused by a stellar dendrite layer that resulted in many small storm slab avalanches. On the first clear day after the storm,on December 18th, a solo skier triggered a very large (D3) avalanche in Red Lady Bowl after 4 other skiers had skied the bowl earlier in the day. The avalanche propagated across much of the bowl but luckily the skier was not caught. 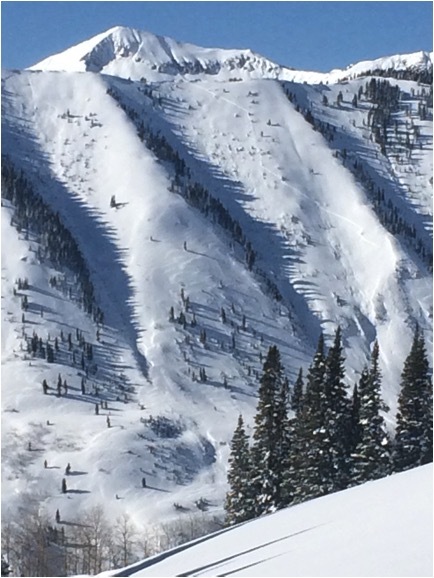 12/18/16 – Large skier triggered avalanche in south to southeast facing Red Lady Bowl resulting in a close call. 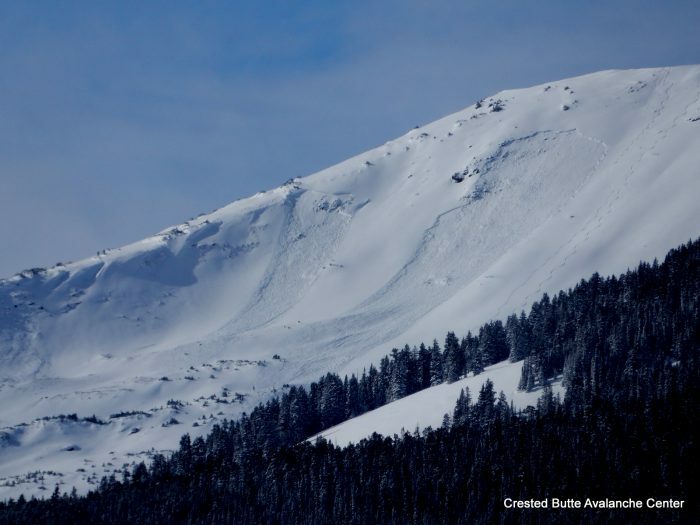 12/18/16 – Large avalanche crown covering multiple aspects and elevations on Mount Bellview. 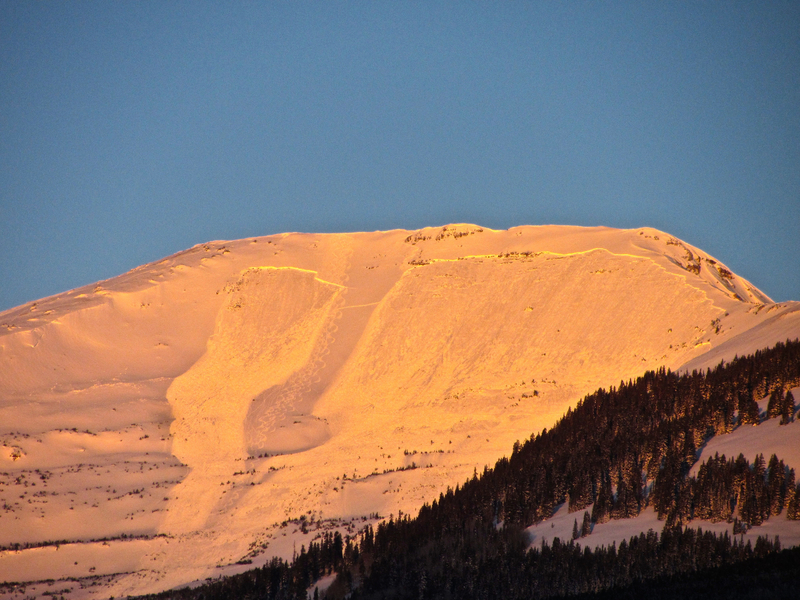 12/19/16 – Avalanche Rose showing recent large avalanches. Finally, after the late start to the season, storm after storm from late November through mid December has brought our snowpack up to above average levels. 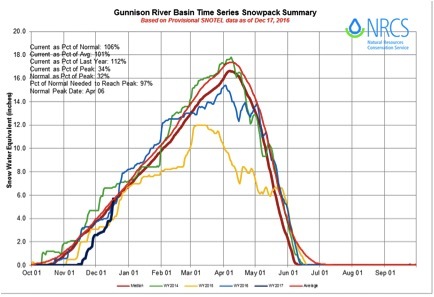 As of December 18th the Gunnison River Basin’s snowpack is at 118% of average. 12/18/16 – Gunnison River Basin snowpack summary showing our current snowpack at 118% of average.